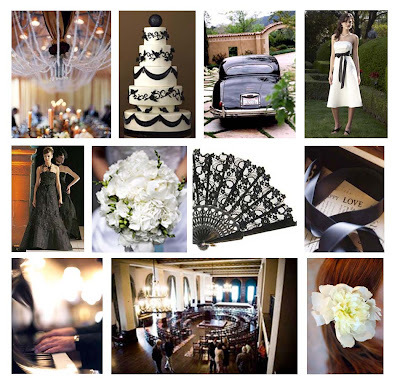 A little while back I posted on the black wedding dress, originally seen on Parisian Party. I wanted to do a color palette around the black dress so I created a black and white palette. I didn't want a mish mash of color to detract from the originality of the dress so I kept color simple. I also didn't want the black and white to be boring so I decided to go with a glamourous look, while still maintaining the classic look the colors offer. I can see this wedding for a beautiful winter affair, perfect for December or Janurary. bottom row: Corridan and Co., photo by Elizabeth Messina, Tiffany Weddings, photo by Image is Found, Janie Medley Flora Design.